Back in February we completely broke down for the first time, losing throttle control, which lead to a lengthy tow to Odessa. That breakdown occurred in a national park (Big Bend) in an area with no cell service but within walking distance of a ranger station, but only because we were able to nurse the bus down the road a ways to the north entrance, where it would go no further. 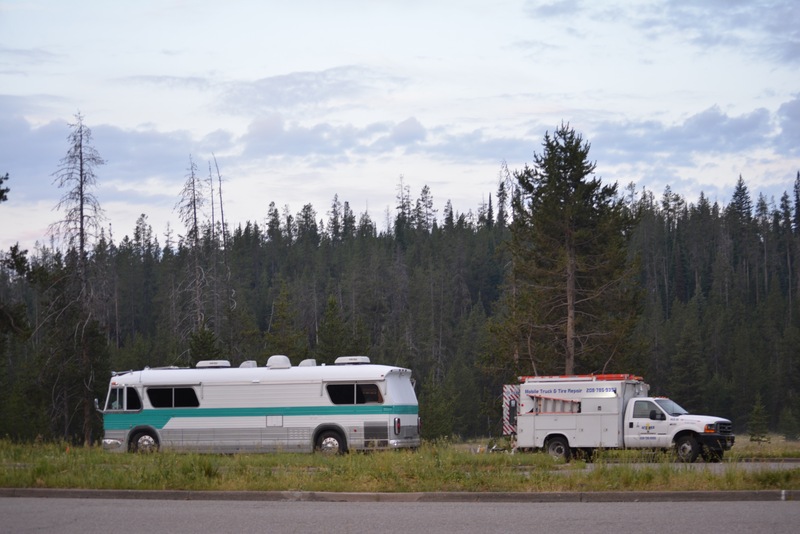 We just had our second breakdown, this one also in a national park (Yellowstone) in an area with no cell service but within walking distance of a ranger station, but only because we were able to nurse the bus down the road a ways to the south entrance, where it would go no further. 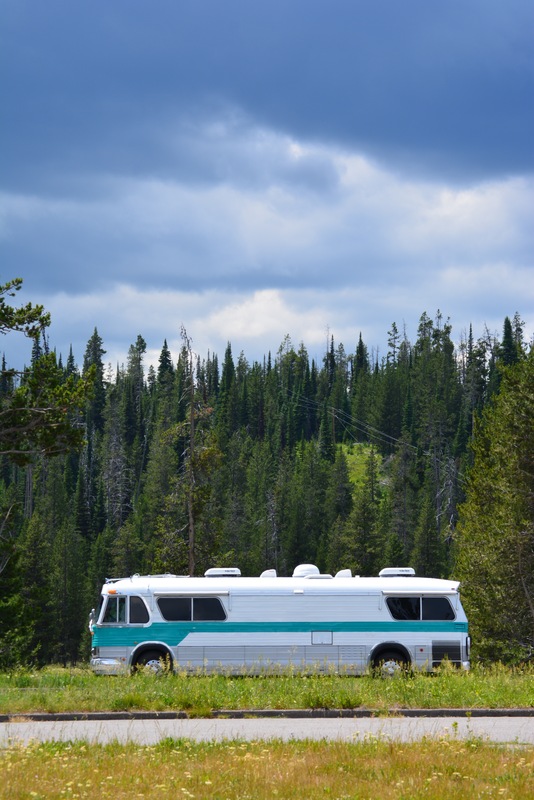 We had just left our three day campsite in Yellowstone and were enjoying the hour or two ride towards the Grand Tetons National Park when The Big Kahuna began to shake and rumble. We initially thought it might be a flat tire, but our tire monitoring system did not go off and visual inspection indicated every thing was ok. With a sickening feeling I assumed it must be the right rear wheel bearing, which recently started leaking fluid; we had determined to get that taken care of as soon as we left Grand Tetons, our next stop. Since we were on a two lane road with absolutely no shoulder, we elected to risk continuing down the road at about 10 to 15 mph, which seemed to keep the grinding and resistance down to a minimum, rather than block traffic on this winding hilly road. 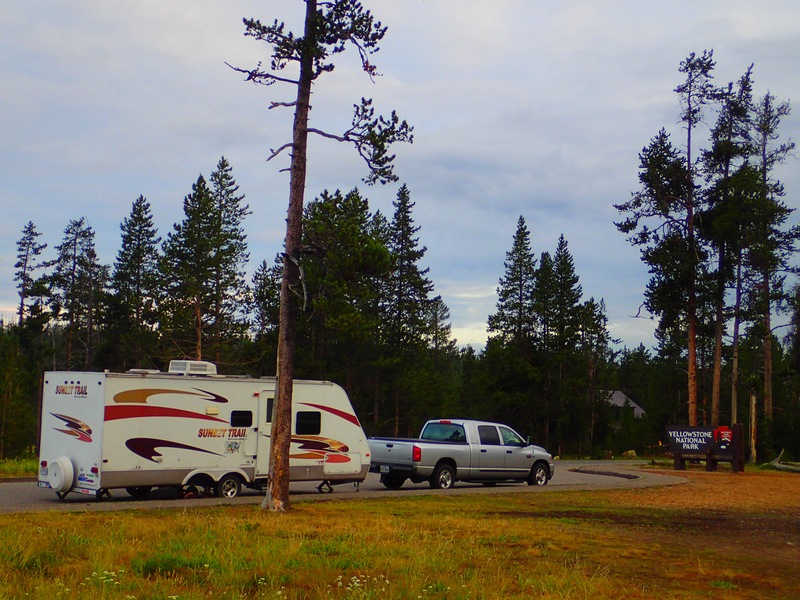 We made the Snake River Ranger Station at the park south entrance less than two miles later. After discussion with the park rangers, we intended to push on two more miles to Flagg Ranch, in between the Yellowstone and Grand Tetons parks, which has a much larger parking lot, a campground, RV park, a small store, and generally would be more suitable to waiting on either a tow or a mobile mechanic. Kahuna had other ideas, with the grinding and vibration beginning immediately after I started forward, even at minimum speed, and fearing he would lock up entirely we pulled into a turn out after a quarter mile. The rangers let me use their phone, and I engaged Progressive’s roadside assistance subsidiary in finding me a mobile mechanic. They came through again, finding what appears to be the most qualified vintage bus shop in the tri-state area. Ace One Truck Repair owner Bill called me back after a brief wait and he made arrangements to come out that night. I also connected him to the driver of another broken down RV, a travel trailer parked on the other side of the road from us. Bill had other jobs and had to do a good amount of research and parts pick up for both of us, and thus did not arrive until five A.M. He started work right off, immediately determining that I had not, in fact, damaged the wheel bearing, but instead had a flex shaft, u-joint, and connecting bracket failure that he contends was caused by the poor job of whomever last worked on the u-joints since he could see how bad a job they did installing them. That would be the repair shop from our last breakdown, and we will be pursuing part of our latest bill under warranty with them. Since our work would require Bill to return to Idaho and get parts ordered or manufactured, he moved on to work on Brian and Kelli’s wheel bearing and axle problem. We had met their entire family, including children Bryce, Kate, and Savannah, the day prior as we mutually supported each other during our breakdown misery. Bill was able to get them on the road that afternoon. 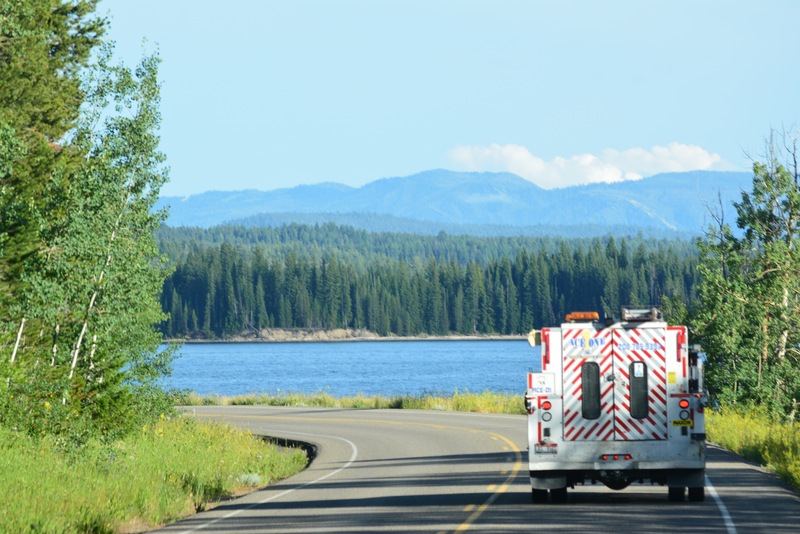 He then towed us the two miles down the road to Flagg Ranch using his F-350 superduty pickup and a length of chain. This was not a pleasant experience as I was riding 15 feet from his bumper going up and down hills while he used his horn to direct me when to break and when to coast. We made it without incident, pulling into the lot behind the Headwaters Lodge at Flagg Ranch. We settled in for what we thought might be a full week of parking lot camping as we awaited Bill’s word from his parts research. Bill gave us the good news the next day: Musselman’s would manufacture a complete new flex shaft and couplings within a day. Bill brought it out the next morning, and after five hours of healthy labor, much of it in the rain, he had us up and running. This was not a cheap repair. Bill cut us slack in three areas, splitting the mileage distance cost on day one between our bill and Brian and Kelli’s, giving us a referral discount for them as well, and waiving his usual credit card fee, but it still cost us over $4,000 to get on the road, though I can say Kahuna rides smoother than he has in months. 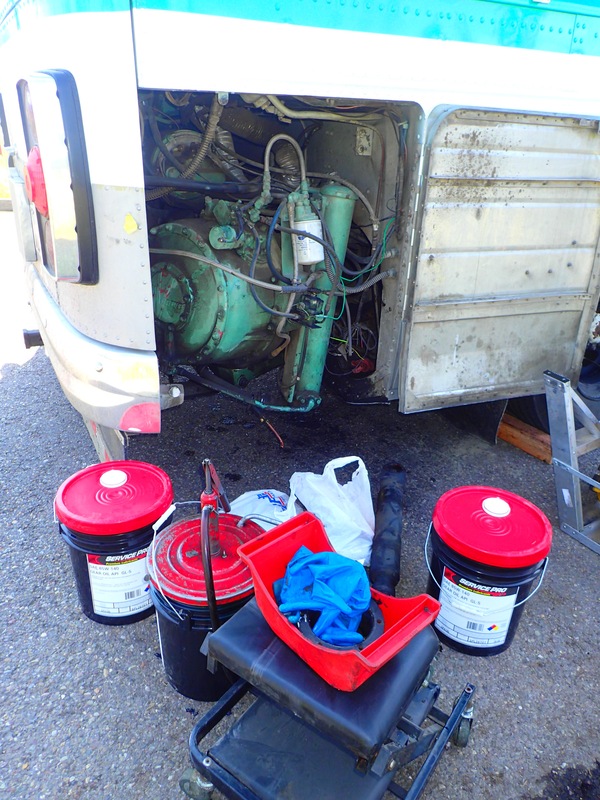 We would like to thank Bill for working well outside normal working hours for the several days or our repair, and we intend to be at his shop Monday morning for some additional elective and preventive maintenance, taking advantage of the much more affordable in shop rates he offers. We also hope Mrs Ace One Truck Repair let’s Bill off the hook for how much after hours and late night work he did for us. We also had great support from the volunteer ranger employees at Snake River and Flagg Ranch, as well as the staff at Headwaters Lodge. They were universally supportive during this entire affair. 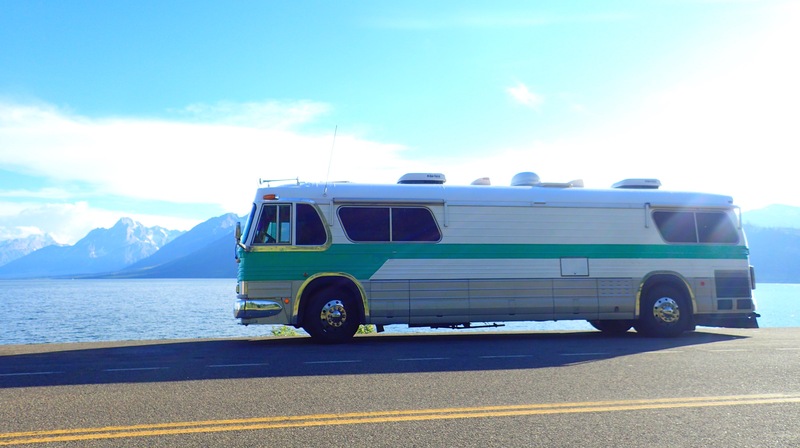 These beautiful old buses are costing us a fortune… I feel your pain! Thanks for the sympathy! Would love to chat with you sometime about pulling a Westy. It was not even on our short list of potential toads until we read some of your posts, particularly one where you took the Westy out while the Wanderlodge was getting work done, iirc. Our concern is the weight of it given our underpowered and overgeared (for speed vice power) engine.